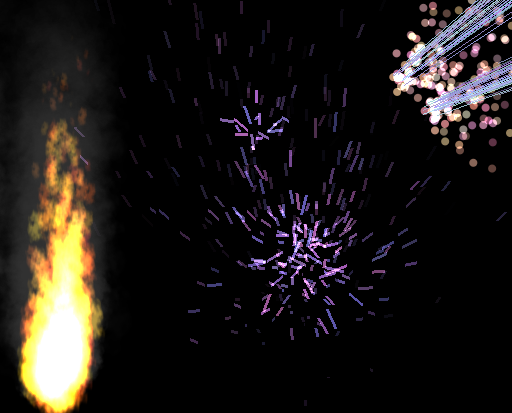 This extension provides the Particle Emitter object, which allows to display a large number of small particles, so as to simulate effects like fire, explosion and many more. 3 rendering mode are available: Points, Lines and Quad. The first mode will display points with the specified size. The second will display lines with specified thickness, and a length that will vary according to the length specified and the speed of the particle. The last mode will display image with the specified size. You can also choose if the particles must be rendered using standard or additive mode. Each particle have a limited lifetime, chosen randomly between two values which can be changed. The quantity of particles contained in the emitter (“tank”) can be unlimited or fixed to a number, in which case the emitter will stop emitting after reaching this number of particles. The flow is the number of particles created every seconds. You can enter -1 to fire all particles in a single shot. You can also change the maximum number of particles rendered on screen by the object. Note that this number changes the memory taken by the emitter. If this number is really huge, it can cause the game to crash. You can choose a starting color for particles, and a color to fade to. Each particle have a red, green, blue component. For each of them, you can choose if the value must be fixed (in which case you can enter the value in the box below), if the value must be randomly choosen (in which case, you can choose the minimum and maximum using the two boxes) or if the value must be changed over the time (in which case, you can also choose the minimum and maximum using the two boxes). You can also choose a starting and final value for the transparency. Size and angle of particles can also be customized in the same way. You can in addition choose if these values must changed over the time or take a random value when they are created. Particles will be emitted in the direction represented by the angle of the emitters on the scene. You can change the angle of the spray cone, which is also represented on the scene editor by two lines: a large value for this spray cone will result in a emission of particles in a large number of directions. A value of 0 will emit particles only in a single direction. Particles will be emitted in a direction. This direction is characterized by its value on X, Y and Z axis ( like forces, with an additional Z axis representing depth ). You can also personalize two angle which describe a portion of a sphere. 0 et 6.28 will define a complete sphere, meaning particles will be thrown in all directions. 0 et 0 will throw particles only in the specified direction. 3.14 and 3.14 will create a disc. You can finally choose the force of the emission, by choosing a minimal and a maximal value. You can add a gravity to particles: simply choose the angle of the gravity force, and the value of this force. You can change the gravity applied to particle of the emitter : Enter its value on X, Y and Z (depth) axis. A value of 0;0;0 will define no gravity. Actions and conditions allow to change same parameters as described above. Condition “No more particles” allows to test if an emitter does not emit particle anylonger. If such a case, it must often be destroyed.